Frequency converter can help you change 60Hz to 50Hz, also can boost 110V to 220V by inner step up transformer, vice versa. Before you buying a frequency converter, it's better to understand what kinds of loads the frequency converter will be connected with. There are five common load forms: 1, resistive load; 2, inductive load; 3, capacitive load: 4, rectifier load; 5, regenerative load; 6, mixed loads. We should select the frequency converter power capacity according to the load capacities and types. Resistive load: Power Capacity = 1.1 × load power capacity. RC load: Power Capacity = 1.1 × load apparent power capacity. Motor load: The motor starting current will be approx. 5 – 7 times of the rated current in case of hard start (direct start), the starting time is usually within 2 seconds. The frequency converter overload capacity is generally 200% within few milliseconds before it triggering overload protection. Therefore, considering the starting capacity, it is recommended to choose a frequency converter power capacity 6 times higher than the motor capacity if the motor is hard starting, means the converter's rated current should be higher than the loads' starting current. Otherwise, you'd better to install a soft starter or variable frequency drive for the motor. Rectifier load: the input circuit includes a rectifier diode (or thyristor) and filter capacitors, if the input circuit has no soft start device, the load can be treated as short circuit during the input switch closing moment, which will generate a huge impact current to trigger the frequency converter overcurrent protection. If there is frequent large starting inrush current, it will also affect the load circuit. 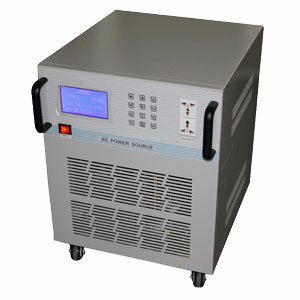 Therefore, the rectifier load input circuit should adopt soft start measures to limit the starting current. Since the rectifier load's current is pulse current, the current crest factor is up to 3 - 3.5 times, so it will affect the output voltage waveform in long-run, the impact is depended on the load's current crest factor. Generally, when the current crest factor > 2:00, select the frequency converter power capacity by following formula: Power capacity = load current crest factor / 2 × load apparent power. Regenerative load: such as reversible motor, variable speed motor loads, there will be a high back EMF during the the motor reverses to damage the frequency converter easily, please be specified before ordering the frequency converter for such loads. Mixed load: consider the proportion of each load power capacity to choose a proper frequency converter. Factory default input voltage is 220V for single phase, 380V for three phase, 50Hz or 60Hz. If you need to change the frequency converter input voltage or have special requirements, please be specified in ordering.